an authentic taste of Sicily. 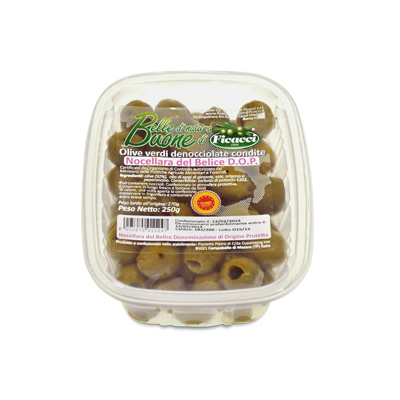 A unique olive with an unmistakable flavor and a firm and crisp texture. The distinct climate of the growing area delivers special organoleptic features to the cultivar making it the only product in Europe to have two different PDO for the same variety. One arranged for the olive oil production "Valle del Belice" (OJ L 273, 08/21/04) and one for the table olive manufacture "Nocellara del Belice" (OJ L 15 of 01/21/98). With the harvest of the fruit taking place in September, one of the essential requirements for any DOP recognition is that the manufacturing process takes place within 24 hours from harvesting. 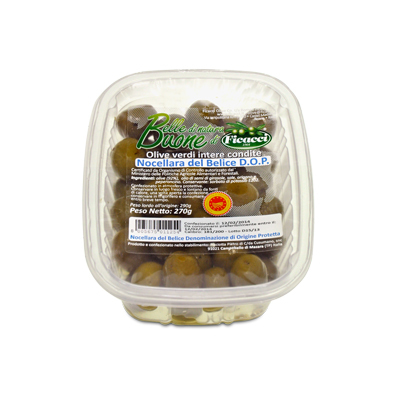 The Nocellara del Belice olives, also known as Castelvetrano olives, are native of the Trapani province in Sicily. The growing area is located between the towns of Castelvetrano, Campobello di Mazara and Partanna, a few miles distant from the Mediterranean sea and close to the Trinity Lake and the archaeological site of Selinunte. known worldwide for the presence of impressive temples. the black pearl of Italian olives. the most suitable olive for cooking.